Nahab are a trio from Kentucky that have recently released their eponymous full-length debut. The album begins with “Azathoth Rising” and features a voiceover of the introduction to Lovecraft’s Azathoth. The voice sounds like it was lifted from a radio show from the nineteen forties. As the man speaks in his perfectly stoic yet slightly grainy voice, a steady drumbeat on the toms plods along. A background of choatic playing and howling wind slowly builds in volume and eventually overtakes him. Though this first track doesn’t sound much like the rest of the album, it’s an excellent starting point, as chaos and Lovecraftian themes are what Nahab excel at. The second track is where the album really starts. And even though it begins softly and slowly, a slow crescendo escalates the song to a furious high-tempo piece strongly reminiscent of Burzum’s “Jesus Død”. The percussion is relentless and heavy on the cymbals; the vocals are distant screams. The combination of these creates a violent aura of bleakness, desperation, and confusion. Like Burzum, this is definitely some low-fi black metal, but it’s not low-fi without purpose. The production works very well with the overall sound and the net result is a chaotic amalgamation that sounds like the mixing was done in a giant blender: the guitars and cymbals fight for the forefront and which one wins changes from one second to the next. During their quieter and more melodic sections (and they have a few of these scattered throughout) the chaos is definitely toned back, but the aura and tone of the album remain untouched. One feels no safer here than in their loudest moments. In fact, in some ways, their lighter sections end up being more unnerving and mysterious than the times when they are playing on all cylinders. So I think it’s safe to say that the best strength of the album is the production. The compositions are mostly simple and straightforward; the riffs and fills are almost completely composed from the minor scale, which results in a surprising level of accessibility in spite of the muddy and menacing sound. But even though the songs might be simple (albeit fast) it’s the overall sound that they produce that perfectly encapsulates their intent. And insofar as we’re talking about Lovecraftian black metal, they’ve pretty much nailed it here. In some of the songs, like the first half of “Sabbat Immortuorum”, there is a definite speed/thrash vibe going on. This could be just because their songs are just generally played fast, but I think their style also brings this out a bit, especially in the execution of some of the faster riffs. I felt like I could definitely hear some Razor in there for sure. You get this vibe also because unlike a lot of black metal, there is a good deal of lead guitarwork in here that doesn’t fall under the category of the usual tremolo riffs. Sure, they do have some single string-riffs in there, but I’m not talking about that. I’m talking about full-on speedy guitar solos that you would be likely to hear on a typical thrash metal album. Though this style of playing does take away from the black metal feel a little bit in those places, it certainly doesn’t detract from the album as a whole. The guitars, both rhythm and lead, still fit with their vision. However, hearing them was a little surprising, primarily because once I get in my head that I’m listening to black metal, I don’t usually expect some fiery lead licks all up and down the fretboard. 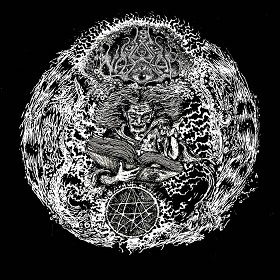 The voiceover returns for the final track “Azathoth Enthroned”, but this time in reverse, appropriately adding to the confusion and strangeness of an already disconcerting sound, and providing an excellent thematic end to the journey. Even though the songs are long, with all but the opening track lasting more than six minutes, the album itself has only a few songs and so is relatively short. If you take out the voiceovers, you’re left with about a half an hour or so of music. But in that half hour, you will find a compelling musical statement worthy of a thoughtful listen.